We honor your reviews especially when you take the time to compose one and/or post it. Yelp Removes Good Reviews. Unfortunately we have no control over what Yelp does. 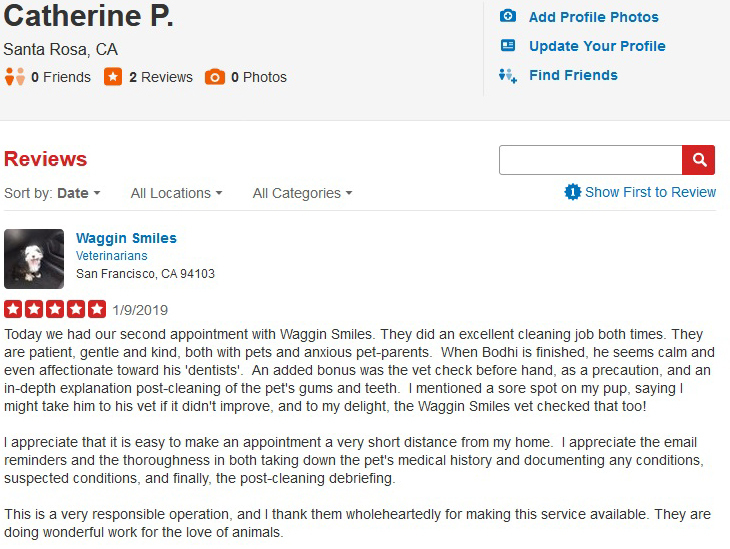 This client's review was removed for our side of the " Waggin Smiles Yelp page". Please let us know if you've posted; we will check to see if Yelp has let it stay up or if they have removed it from our Waggin Smiles Yelp page. It will still show up on your side "your own Yelp page", but it may get removed from viewers on the Waggin Smiles Yelp page . We can let you know if it's still up. Thank you.